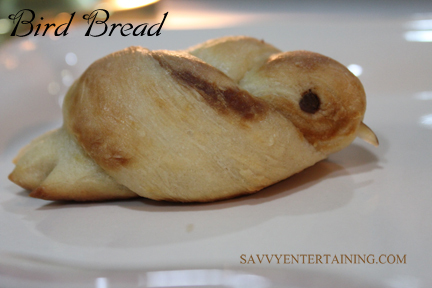 I saw a photo on Facebook of bird bread a while back. I knew I had to give it a try at some point. When I decided to go with a Wish It Were Spring Theme for my book club gathering, it seemed like the perfect thing to make. Of course, by then I could no longer find a link to the recipe or directions, so I decided to wing it (yes, pun intended). 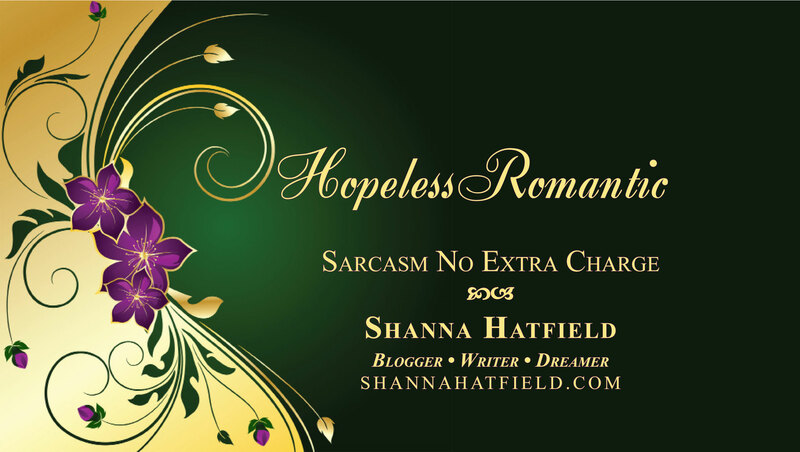 It wasn’t hard to do but if you are looking for uniformity, that would so not be my name. Ingredients. 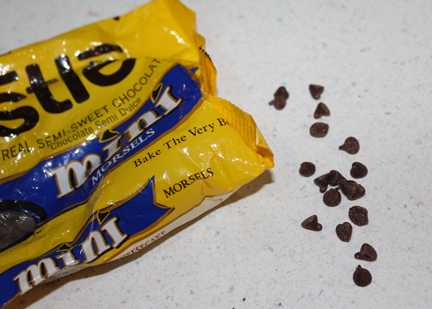 Plus you’ll need mini chocolate chips and slivered almonds. Start by scalding milk with oil and sugar. 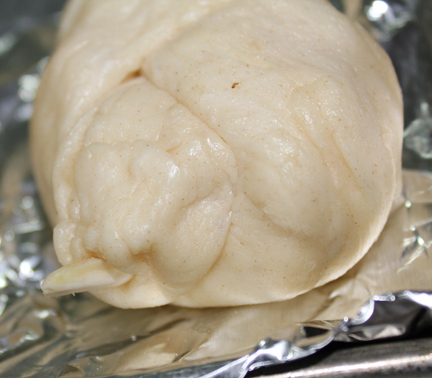 Once the milk mixture has cooled to lukewarm, you can add in a package of yeast. Sprinkle yeast over the milk and let rest for a minute. Stir in yeast and four cups of flour. Place the pan in a warm area, cover with a tea towel and let the yeast do its thing for about an hour. I like to put my pan in front of the fire. It is warm and makes the dough smell heavenly. 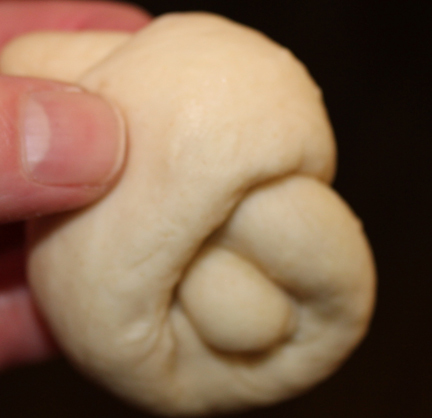 Punch the dough down again and start pinching off pieces about the size of a golf ball. You’ll have a couple dozen balls when you are finished. Then roll those balls into a long rope. I found about 12 inches worked well. 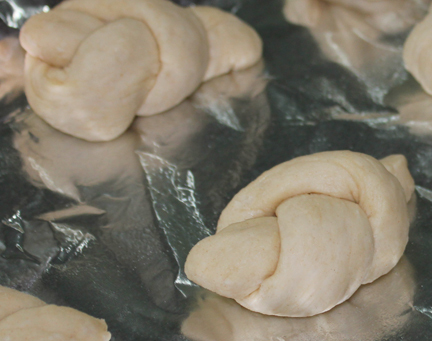 You are basically going to tie a knot with the dough. Just fold one end under and one end over. It will look something like this when you get it pulled together. The end that is “over” is the head and the “under” end is the tail. 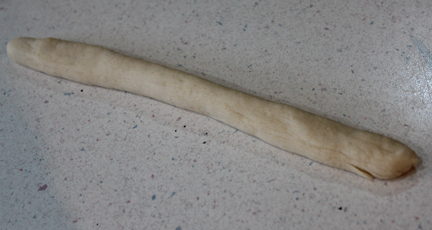 Take a pair of clean kitchen shears and cut little slices into the tail. This makes the feathers. See? How cute is that? And mini chocolate chips for the eyes (you could use cloves, but chips sounded tastier to me!). 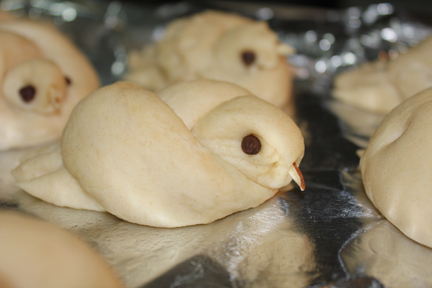 And your birdy should look like this when you get done. 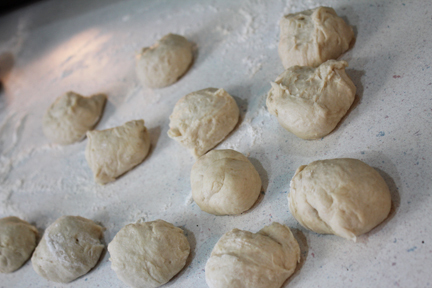 Let the dough rest about ten minutes then bake at 350 degrees for about 12 minutes. And it looks all golden brown and lovely like this. 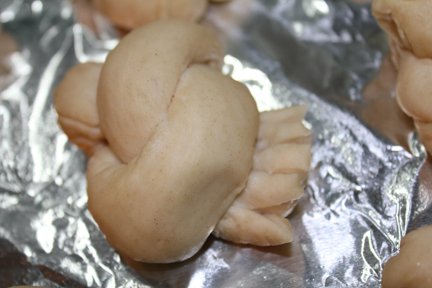 Oh, and poke the chips so the narrow end goes into the dough instead of the flat end. It works much better! Scald the milk, oil and sugar in a medium saucepan over medium heat (bring heat to nearly a boil, but don’t let it boil!). Set aside and cool to lukewarm (think temperature of a baby’s bottle). Sprinkle yeast on top of milk and let rest for one minute. Add four cups of the flour and stir until just combined. It is going to be sticky. Cover with a tea towel and set in a warm place for an hour. 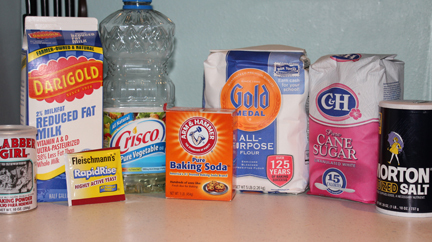 Remove the towel and add baking powder, baking soda, salt and final 1/2 cup of flour. Stir to combine. 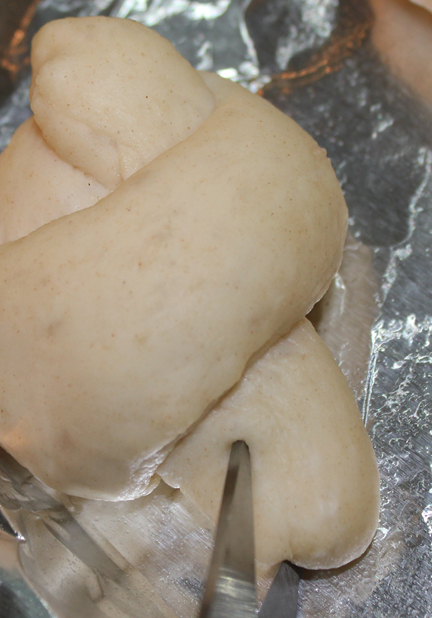 Pinch off golf ball sized pieces of dough and roll into ropes about 12 inches long. Fold each rope into a knot (just like tying your shoe) with one end up and one end down. The up end will be the bird’s head, the down end will be it’s tail. Using a clean pair of kitchen shears, cut feathers into the tails. I made about four half-inch slices. 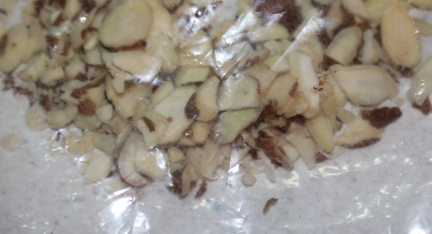 For the beaks, poke a slivered almond into the head where it looks like beak should go. 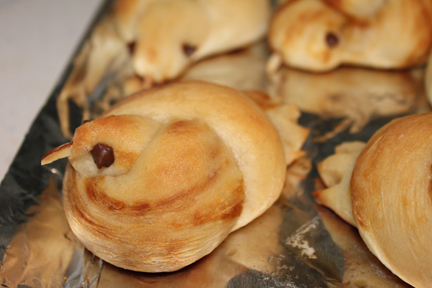 Add mini chocolate chips (pointy-end facing the dough) for eyes. Let the dough rest for about ten minutes (preheat oven to 350), then bake for about 12 minutes, until the bread is golden brown. 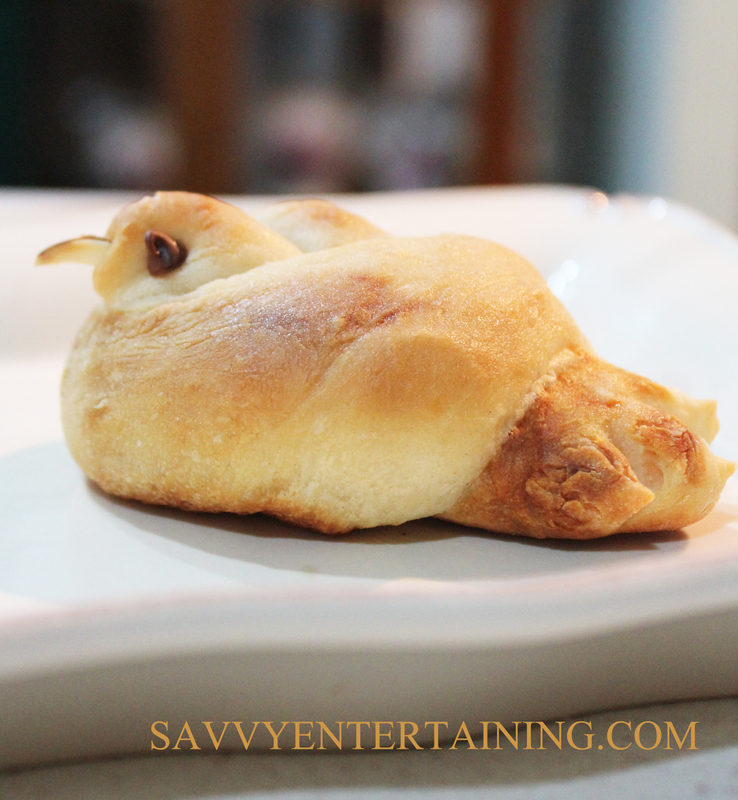 You can’t help but smile with one of these little birds on your dinner plate!